Dahlias are wonderful flowers that grace the garden with their colorful blooms from Mid Summer, until a good killing frost. Dahlias come in a wide variety of sizes and colors. Some dahlias produce flowers the size of small carnations, while others produce giant heads that are compared to dinner plates.I have never got mine to grow that large or ever seen ones that big, but I am only a back yard gardener, not someone who knows all the tricks that you have to know to grow prize winners for competition. 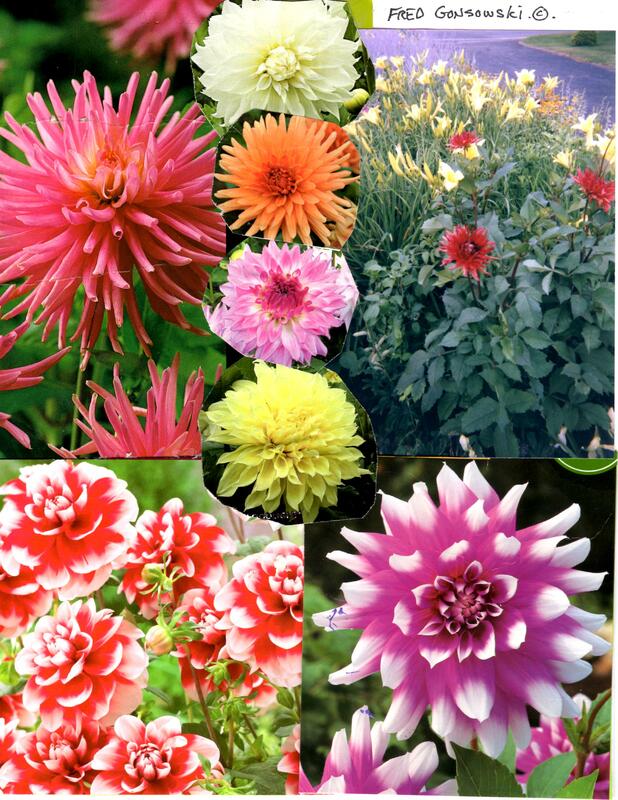 There are many different colors of dahlias. White, pink, maroon, red, orange, yellow and purple are the colors of single colored flowers. Two-toned dahlias are most often a combination of any of the single colors just mentioned. You will see pink with yellow, red or purple with white, and orange/peach with red, to name a few. Dahlias come in 3 basic heights. You can get short varieties that top out at 12 to 18 inches. Some dahlias in the medium height range grow to about 24 inches, and the dinner plate ones can reach 36 to 48 inches. Buying Dahlias ..Dahlia tubers are sold from late Winter through Spring. You can get them from Big Box Discount and Hardware Stores with garden centers like Wal-Mart, K-mart, Home Depot and Lowe’s. Your local Garden Center will have a nice selection to pick from. Mail order catalogs are a third option. Whatever way you get yours is fine. If you purchase yours locally, they will be packaged up in labeled plastic bags, in sphagnum peat moss, in quantities of 1 to 3 tubers. Look for tubers that look and feel solid, are big of size, and possibly show some eyes or Spring growth. Don’t go overboard buying too many of the same variety. Those nothing looking potato like tubers will multiply quickly, and in a year or two, you will have more than you can plant. Planting Dahlias ..In my neck of the woods, which is the Upper Hudson Valley of New York State, zone 5-4, May 1 is the perfect time to get the dahlia tubers in the ground. If I am feeling industrious, April 15 is a perfect time to plant them up in plastic pots, to get a jump on the growing season. If you choose to pot them up on April 15, here’s what to do. #1 Soak you dahlia tubers in water for 15 to 20 minutes to hydrate them. #2 Plant then in large plastic or terracotta pots that you know you can easily get them out of when it is time to plant them in your garden. The best containers to use are ones with shapes that flair out as they go upward to the top. #3 Plant you dahlias, one tuber clump per container in a good soil, with a hand full of dehydrated cow manure mixed into it. Plant the tubers so they are covered by about 1 inch of soil. #4 After potting up your dahlias, place then all close together in the sunniest part of your garden. Once your dahlias start to emerge from the soil, if there is danger of frost, cover them all, that night with an old blanket or heavy sheet. Uncover them the next morning. #5 Around / after Memorial Day it will be the perfect time to plant them in your garden. If you prestart your dahlias in pots, or just plant them in the garden, the planting method is the same. Hydrate the tubers, and amend the soil for best results. After planting, you can also sprinkle some time release plant food on the soil, like Plant-tone. If you are planting older clumps of tubers, separate them out. Just pry the large clumps apart. Don’t worry if some pieces break off. Plant loose tuber pieces on their sides, and see if they grow. Site your dahlias so they are planted in full sun, which is 6 plus hours of direct sunlight per day. If you are industrious stab 3 or 4 bamboo stakes, about the height of the mature plant, into the ground around the tuber at the time of planting. As the plant grows, you can tie jute around the stakes to support the plant. I am not a purest, so I seem to skip this step, only to stab bamboo stakes into the ground, when the plants are leaning over, or have fallen down, and need to be stood up again. When it comes to flower production, the more you pick, the more you get. Pick flowers for bouquets, or to give away. If you leave flowers on the plant, once they start to fade, cut them off. Winter Storage ..Dahlias will produce flowers and continue to grow until a good killing frost ends their growing season. Don’t dig up dahlias until they are killed by a hard frost, and the leaves have blackened. The blackening of the leaves stops the photosynthesis process, and “hardens up” the tubers so they will live through Winter storage. If you get a good killing frost that blackens the dahlia’s leaves in late September or early October, try to wait about two weeks before digging up the plants. That will be plenty of time to ready the tubers for Winter storage. If a killing frost comes in late October, try to wait 4 or 5 days to a week before digging. If you have no killing frost by November 1, just dig up the plants. Nature will have slowed them down enough, by this time for storage. After digging your dahlias, cut off the dead foliage, leaving 2 or 3 inches of stem with each tuber. Wash soil off the tubers with a hose, and let them air dry, out on your lawn for a day or so. I make piles of each variety on the grass, in the piles I stick wooden markers that I made with each variety’s name and description of color, so I know what is what, when I store them. After being washed and drying outside for a day on the lawn, I box them up. I store my dahlia tubers like my Grandmother did. She put multiple clumps of tubers in boxes. On top of them she put a few sheets of newspaper, then a cover. She stored her’s under a stair case that went to the lower level of her house. I store mine in a semi-heated room, behind the garage that stays about 45 to 50 degrees in Winter. So there you have it. Dahlia cultivation is simple once knowing a few planting basics. Hopefully you will try growing a few plants. You never know, you might get hooked. ??? If any of you, out there know how to grow a Dahlia flower the size of a Real Dinner Plate we would all like to know. Leave detailed instructions in the Leave a Comment for us all to read. When Designing a Perennial Garden It’s ALL about the Shapes of Leaves 1-15-2011. This entry was posted in The Autumn(Fall) Garden, The Spring Garden, The Summer Garden. Bookmark the permalink. As I was saying…I am going to try and save mine this year. In the past, if I saw they turned black, I thought I was too late to save them! Thanks for all the tips!